If years of marketing and television has taught us anything is that girls love diamonds and diamond wedding rings are wedding essentials. While some girls do love large rocks on their engagement rings, stereotyping an entire gender is neither fair nor accurate. A lot of young newly weds are breaking the social expectations and buying inexpensive wedding rings. The money they save often goes into buying a new house, going for a vacation, or paying off their student loans. No matter what, the trend of buying cheap wedding rings is definitely on the rise. If you are someone who is contemplating buying a budget ring, then following are 5 reasons why it’s definitely a good idea. You Save a Lot of Money: Buying wedding rings and engagement rings are a major wedding expense. Even couples with limited budget often give into societal pressure and expectations and end up spending thousands of dollars. Remember that the price difference between an inexpensive wedding ring and something like a diamond-platinum wedding ring is huge. Here’s an example. The cost of a single 1-carat diamond with moderate clarity and color is well above $1500. Cubic zirconia, on the other hand, costs only $20 per carat. There is a range of different affordable options between the $20 cubic zirconia ring and the platinum and diamond ring. You can get rings for a few hundred dollars with semi-precious stones such as peridot and amethyst that look just as expensive as a diamond ring. You Are Not Breaking Wedding Tradition: The so called “tradition” of buying a diamond ring for weddings was a marketing ploy that was started by De Beers. In fact, the tradition of buying rings was all but non-existent a hundred years ago. Therefore, if you thought you were breaking any wedding traditions by not buying a diamond ring then now you know better. Because You Dared to Be Different: While diamonds are marketed as rare and expensive the supply of diamond rings never seem to slow down. From online jewelry stores to local malls, diamond rings are available everywhere. 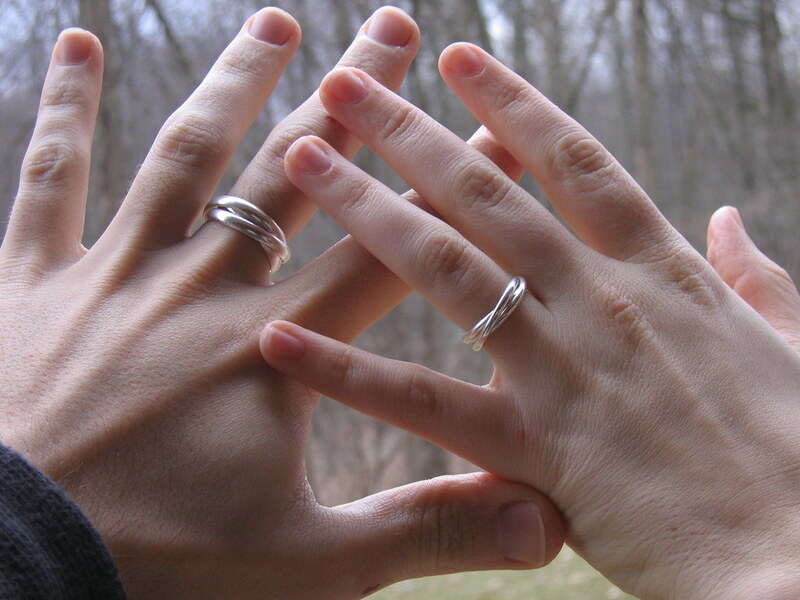 Almost all newly-wed brides sport diamond rings on their fingers. The fact that everyone around you has diamond wedding rings makes buying one less special. There is no real exclusivity factor. That’s why a lot of couples are opting to buy alternative wedding rings that look radically different. Plenty of Inexpensive Wedding Ring Options: There are plenty of other metal and gem options that can drive the price down without compromising the look. Stone such as aquamarine, peridot, citrine, amethyst, and others come in beautiful bright colors and are as luxurious looking as diamonds. You can even choose to buy a ring that’s fitted with a lab-grown sapphire for less than $100. Not Starting Your Marriage with a Debt: Do you really want to start a marriage with a debt? Most couples visiting jewelry stores often end up swiping their credit cards to buy something they cannot really afford. This causes them to start their married life with a significant debt. Ask yourself this. Would you want to buy an expensive ring or start saving up for your first house? If you have enough money for both then you should go right ahead and buy that expensive ring.